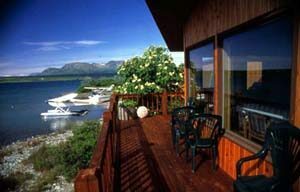 Bristol Bay's Alaska Salmon Fishing Lodge is nestled on a private peninsula on the shore of majestic Lake Iliamna, the heart of Alaska's finest fishing region. Our Alaskan style great room provides a cozy atmosphere for guests to enjoy our spectacular lake and mountain views. Guests may also relax before the fireplace in our living room, or enjoy a game of pool in the recreation room while reminiscing about the day’s fishing – and planning for tomorrow. Bristol Bay Sportfishing offers many other amenities to provide you the ultimate in comfort during your wilderness fishing adventure. 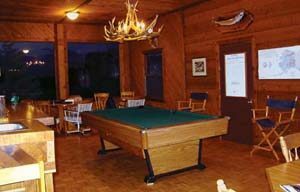 Comfortable lodge bedrooms and cedar-paneled guest cabins, all with individual bathrooms, provide privacy and rest after a long day of fishing. We maintain a well-equipped fly-tying bench for anglers who wish to try their hand. If you wish, we’ll be pleased to demonstrate how to tie our favorite -- and most effective! -- local fly patterns. Bristol Bay Sportfishing guests may also visit our gift shop for a great selection of unique clothing items to take home. Your hospitality could not have been any better. The care and time you took with each and every guest was outstanding. The fishing was incredible and it was especially impressive to see how well organized you were throughout the days events. We ate like Kings at every meal, thank you for all the time and preparation put forth to insure we had the very best! Vice Chairman, Publix Super Markets Inc.
Having never been to Alaska before, I did not know what to expect, but you certainly exceeded my expectations. Everyone in our group was impressed with the attentiveness of your staff and the operational efficiency of the equipment. Certainly the variety of fishing is something I had not expected. The food, camaraderie, accomodations and everything else were extraordinary! While every precious memory is fresh in my mind , I want to try to tell you both how grateful I am to you for your fantastic hospitality. The food, the fishing and plane rides were awesome.